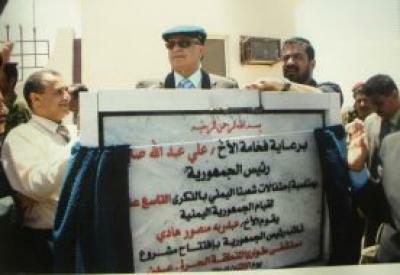 Almotamar.net, Saba - Vice President Abdo Rabu Mansour Hadi paid on Sunday an inspection visit to Aden Refinery Company where he inaugurated and put foundation stones for a number of new projects. He laid the foundation stone for the regional center to be tasked with carrying out different training courses at a cost of YR 1.6 billion. He also launched work at the new electricity power plant with a production capacity of 3.5 MW in the first stage to ultimately reach 40 MW for the operation of the refineries. Hadi expressed appreciation for the big efforts done by the Aden Refinery Company to achieve the required progress serving the economic and oil process. Vice President also visited the Local Council headquarters of Al-Mansourah District and got acquainted with damages caused to the building by anarchists who infiltrated into the protests. He affirmed the necessity of confronting those who implement such plots at the account of security and safety of Aden.